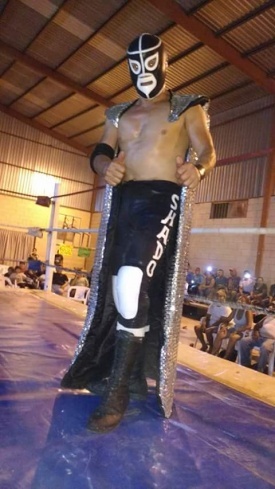 El Hijo de Black Shadow/Black Shadow Jr.
Name El Hijo de Black Shadow/Black Shadow Jr.
Born in Tampico, Tamaulipas, he went to Mexico City at the age of 18. He trained boxing for about three months, but he did not like. In that gymnasium he met a lucha libre trainer, that man was Tom Mix. He decided to train with him, he also trained with Blue Demon at some point. His debut was in Xalapa, Veracruz in 1983. His first ringname was El Hijo de Tom Mix (do not confuse with Tom Mix Jr.) for about four years. As el Hijo de Tom Mix, he worked at Pista Arena Revolución and with Benjamin Mora. He had matches against Bestia Salvaje, La Fiera and Babe Casas. He agreed with Black Shadow Jr. I (Juan Jose Salazar Alanis) to use the name of El Hijo de Black Shadow both were at the Copyright to register him under that name. Black Shadow Jr. I eventually allowed him go as Black Shadow Jr. as well. He worked in arenas at Guadalajara, Acapulco, Monterrey, Colima and more. His hardest rivals were El Perverso and Tigre Mariscal. On 2002 he was invited by the promoter Jorge Gonzalez (Bala de Plata) to Mexicali during the years of La Nueva Imagen in Arena Coliseo Mexicali. Sometime later he went to Arena Mexicali until he changed to Empresa Arena Nacionalista. Regarded for his technique and highflying moves. Has a notable feud with El Marino. He is an experienced and well respected trainer who had guided new generations of wrestlers in Baja California since his arrival. He is the head trainer for Empresa Arena Nacionalista since 2015. Many of his trainees describe his sessions as intensive. His sessions are at Arena Coliseo Mexicali. He retired from active competiton on November 25, 2018 in Arena Nacionalista. This page was last edited on 5 January 2019, at 22:06.